How true Mr. Shakespeare was. If I am called by some other name, will I change? My family and relatives call me Lucky, friends call me Miss. T, some boys in college use to call me shooter, on passport and certificates it is Sweta. Different names, but I don’t change my behavior or characteristics depending on the name. I am same with friends, family, colleagues and classmates. (Some differences may come, but it’s based on my relation with them and not because they call me by different name.). By the way, I am not going to go on the “My Name Is Khan” way, which says that judge people based on their work and character but not based on their name. As the movie has already shown enough on what the above quote mean. Actually, I will share with you how this quote helps me to reduce my guilt whenever I fail to recall someone’s name and create awkward situation for myself and them. Otherwise I have a very good memory which remembers so many birthdays, old incidents, hour’s long pointless conversation I did with my friends and yes TV commercials (I can sing the jingles exactly as on TV. In my friends group this talent of mine is very much hit :) ) and many other unwanted stuffs. But I am name challenged. And somehow I always manage to fall in the soup. There are many such incidents and sharing all of them here is not possible. But the point here is, do not feel bad when some name challenged like me forgets your name or calls your name incorrectly or with wrong pronunciation. As our work and character speaks for us, and not only the name. So be good, live happily and forgive the name challenged people :D .
Birthdays are always very special, and for me, this is the day when I feel like a celebrity. Calls and texts from all the friends, blessings from elders and so many gifts, makes this day really exciting and fun filled. I start planning for my birthday weeks before it. I remember nearly all birthdays of mine, the fun I had was amazing. Well I don’t remember my first birthday (as I was not a super baby with memory card inside my head), but mom says they had a big celebration with all family and friends. I remember in school day’s birthdays use to bring the same enthusiasm like festivals. Whether it’s my birthday or my brother’s or sister’s birthday, all three of us get new dresses else we will fight for it... Wearing colourful dress in school, distributing chocolates in class and getting handmade greeting cards from friends (I still have a bag full of such cards) was what I use to do after special pooja on birthday morning. My mom use to light lamps equal to my age during this pooja. On that evening we use to have a get-together with all relatives and our friends. We three (me, bro, sis) will go and invite the kids with whom we use to play in colony. In childhood I was very fond of lipstick. After my continuous irritation and bothering, mom will finally agree to put a small mark on my lips and I will be so happy. My dimples flash :) . Balloons and 'Happy Birthday' stickers all over our drawing room contributes to the ambiance, as I cut my beautiful cake and then we all dance for hours. There was this Miss L in our colony who declared herself to be a good dancer, but according to me , she is just a copy cat who blindly copies steps from movies (yes its true, not everyone can show steps on the fly as I do sigh :P ). I was always green eyed on Miss L, as on our birthday parties she used to steal all the attention (As a proof of my jealousy there are photos in my birthday album, where she is dancing and I am staring at her from corner). When I went to high school this big gathering was replaced by less relatives and more friends of mine, but the dance and fun was same (Of course now Miss L was not invited, as I stopped playing in colony, and I was enjoying all the attention :D ). Now archies and hallmark cards took over handmade cards, but the feeling behind the cards were same. Till college this is how I celebrated my birthday. From the time I left home, for my birthday I only buy my birthday dress, go to temple for pooja (as I don’t have so many lamps with me), now as I have some chillar in my pocket I give myself a good gift (don’t laugh, actually somewhere in one motivational book I read “reward yourself”, I apply it in my life. I give gifts to myself whenever I do something really good and on my birthday. It works well for me :P). But the number of phone calls, wishes and blessings are still same. My mom, dad sends me greeting cards on every birthday. Yes! In childhood during cake cutting we use to keep looking for the piece containing cherry, and now we look for chance to put cake on birthday boy’s/girl’s face. Now I am not with my family but I have wonderful friends who make my birthday special. Today it’s my fourth Birthday away from home. But the fun and joy is all same. 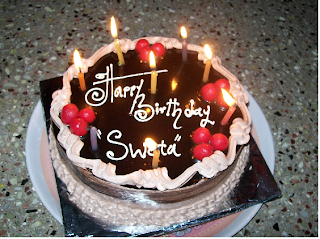 All friends wished me. Some sweet ones took the pain of remaining awake till midnight just for wishing me first, thank you so much for all your wishes :) . All in all I had a nice day. And with this passing day I became smarter and mature, as I believe “more age = more smartness” ;) . From the time I came to Bangalore my lifestyle changed a lot, Thanks to the fast-paced metropolitan life style :). Every time I go to big malls I feel the difference in living in big city compare to the small one. I thought I will share my thoughts with you all. Let us see how treatment of same issue changes with change in place…. Small city: Fight with sabji wala bhaiya for 2 Rs/- or for complimentary chilies & coriander leaf, dice all the fresh vegetable yourself. Big city: Pay 10 Rs/- extra and buy two days old diced vegetable from supermarkets. Small city: Car comes out of garage for monthly cleaning or to go for function at some close relative’s place, when invitation is with family. Big city: Car comes out of garage everyday to go to office or to go for jogging. Only one person sits inside and burns petrol. Small city: Cable TV is used to its maximum limit by watching bhakti satsang in morning, daily soaps in afternoon and evening, followed by news at night. Big city: DTH TV with more than 200 channels, great picture and sound quality is available in every house, but no one has time to watch TV. Small city: You know in and out of your neighbor. Even remember their relative’s names. Big city: Don’t even know the full name of the person living next door. Small city: On festivals many dishes are prepared at home, friends & family eats together at home. Big city: On festivals family goes out to have homemade style traditional food in restaurants. Small city: While going out with small babies, bags are used to keep baby food, water, diapers etc. Big city: While going out with small babies, bags are used to keep the baby (baby sling). Small city: Going to cinema or restaurant is luxury. Planning starts weeks before this outing and full family gets in their best attire for this outing. Big city: Going to cinema or restaurant is a routine. You can easily find people coming to multiplex in their shorts or pajamas. Small city: Two hours of travel take you to some relative’s place in neighboring city. Big city: Two hours of travel take you to your office every day. PS: If you come across any more differences, feel free to comment :). This is a very beautiful song from the movie Albela (1951), very famous bollywood lori*. In the movie hero sings this song for the heroine and she goes to deep sleep… which makes me feel jealous of her. Are you wondering why I am green-eyed on her if she is sleeping? Am I jealous because she has a hero to sing songs for her, whereas I don’t have a side hero also? What is there which agitates me? Okay, enough of these scary question marks (? ), as they remind me of my school exams. The torture we use to undergo for full three hours. That doesn’t mean I hate to go to school, actually I use to wait for my school bus on Sundays also :). Well, before I go back to my school days let me come to the main topic. Yes I was talking about my envy for the heroin in that song. To be precise, my concern is not the lady in song but her sleep. I feel jealous about how conveniently she gets her sleep whereas I need to toss around on my bed for hours before I could enter my fairy world of dreams. I have this problem with sleep, it takes me time or say takes more time than the normal human of my age. All the thoughts waiting for their encounter with my brain throughout the day get active at bed time. All the pending work will make their entry in my head at that hour of the day when I am looking for some rest. I keep changing my position on bed with the hope that this new position will attract Nindiya rani (term used for sleep in lori*) and she will come to me, running in slow motion wearing white gown as the heroines in the Hindi movies of late 80’s. But all my creativity goes for a toss when she dislikes me over others and comes to me only when she is done with everyone. But in the morning, she is not ready to leave me after three alarms also. Every morning I run and catch my office bus. And all fellow passengers give me a look ‘AGAIN’. If I plan to go by the next bus which comes after 30 min from the first bus, I get the last seat as many people prefer this pickup time and my stop is the last pickup point. This leads me to reach office bouncing up & down… People who ever got to sit on the last seat of the bus in Bangalore can empathize with me better. Now you see how one problem creates other problem and becomes the reason for it. among so many reasons for so many problems I have to find out the root cause which is creating all this mess, and that will lead to the foolproof solution. (just trying to show off my Quality circle* skills ;) ). Hence to get sleep on time I have tried many things. Few cases are listed below. I can see the change in expression on your face. You must be anticipating is this guy brainsick. He is giving more work to the brain and expecting it to find rest. How he gets sleep like this? Is he an Indian politician? As only they can sleep when asked to think about nation’s development (remember the parliament session)… Please put a brake on all the perceptions you are making about my friend, as he is mentally alright, and he is not a politician too. Even my mind does not accept his idea but being a good friend I should trust my buddies. And just for the sake of the bond we share I tried it myself. Yes I did. Now please don’t think that I am half-baked, as it did not work for me. Thank god I am alright . This one I learned from my yoga teacher. In his words “Every one lay down on your back. Leave your body free. Now starting from little toe see your body in imagination. See each part of your body one by one. Relax that part and move on to the next part.” We were supposed to start this relaxation process from little toe and end it on top of our head. You won’t believe me but I saw people sleeping in the class while doing this exercise (may be they slept as they got bored seeing them self’s). Sooner the Om chanting sound got a new rhythm of snores. With very few conscious minds left in the class, including me and our yoga teacher. I feel the number of conscious minds could have been more if we were asked to check in girls on brigade road (for me brigade road is the best place to upgrade ones knowledge on latest fashion trends). Mom said “Do some physical activity, once you are tired you will get sleep fast”. And I started looking for ways to make myself physically tired. I must tell you it is not an easy job for someone like me who sits in front of the computer for 10 to 11 hours a day, leaving the seat only to go for lunch or to use the restroom. It is a challenging task to look for opportunities to make my body tired enough so that I get sleep as soon as I am on bed. I tried walking for some days by getting down before my stop. And the result was an increase in my earring collection as I am very fond of these colorful dangling pieces which add attraction to the face instantly, and there were plenty of such shops on that way. But Nindiya rani is not so fashion conscious; she did not accept the earring bribe and rejected me again. Apart from these cases I even tried reading. But all the books except course books were interesting. I ended up being awake for more time than the usual. Poor me failed to attract Nindiya rani again :(. With so many failures again and again, I am not losing my hopes. I am sure one day Nindiya rani will become my friend, and will take me to deep sleep filled with sweet dreams. One day Nindiya rani will give me some place in her heart and will come to me whenever I will call her. I will also enjoy 6 to 7 hours sleep and will catch my office bus without running behind it and reach office peacefully. I pray the same for everyone who has starting trouble like me (with sleep). May god bless us all with good sleep on right time :). *Quality Circle: group of people, who are trained to identify, analyse and solve work-related problems and present their solutions in order to improve the performance of the organization.